This week British composer Jack White is in Reykjavik, Iceland working with the South Iceland Chamber Choir (SICC) prior to their performance at Reykjavik Arts Festival this Saturday in Harpa. As part of our production focused residency programme Collaborative Compositions 2013 White is adding the element of movement to the work “Islands (Ynysoedd)”, which was premièred by the SICC in November 2013 and heralded as “terrifically imaginative and effective” by The Daily Telegraph. “Islands (Ynysoedd)” was premièred in Southwark Cathedral alongside Sir John Tavener's new work "Three Shakespeare Sonnets" following his passing. White originally included the element of movement as part of the performance, with the choir representing water in its three physical states, but decided to leave it out at the memorial concert given the occasion. Saturday's performance in Reykjavik will therefore be the first time the work is fully realised as intended by the composer. During July the SICC will also go on to deliver performances at Salisbury International Arts Festival and Umeå European Capital of Culture. Salisbury tickets available at Salisbury International Arts Festival. In this piece the members of the choir represent water in its three physical states. The choir start very closely packed together representing ice. As the piece develops the ice begins to melt (this begins at b.23). 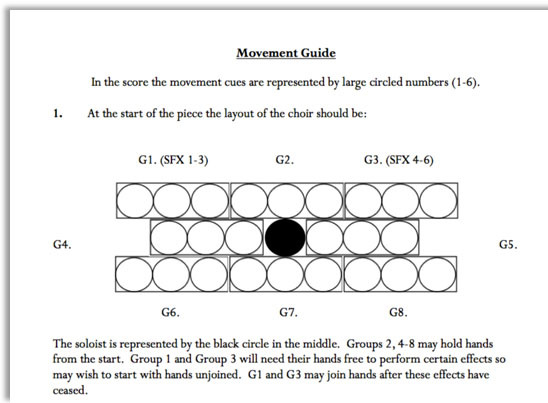 The members of the choir separate from the rigid structure of the larger group, and break-off into groups of three. In this state representing liquid (from b.35), they move around a central point (the solo soprano) and as they gain more energy they begin to spread out from this centre. The choir eventually completely separate from each other, representing a gaseous state (by b.55), and fill the entire performance space. The choir’s music should flow easily between these states and match the visual metaphor for this transition. For the purposes of the transition and the movement element of the work, the choir is required to learn the piece from memory. The work’s score is only for learning the work, and not intended for performance. If the number of singers in the group is not divisible into groups of three, add any ‘excess’ singers onto the solo soprano making an extra group. This group will not be required to move like the others, but could choose to follow one of the other group’s material during the central section of the work.